Translations of Sayings From the Founder of Nath Yogis – Zero Equals Two! 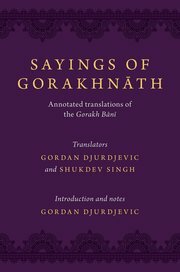 “Sayings of Gorakhnath presents a translation of late-medieval texts in Old Hindi, traditionally attributed to one of the founders of the Order of Nath Yogis. The Naths are associated with the creation and development of hatha yoga, with important historical and ideological links to Hindu tantra and alchemy. The texts gathered in this collection on the one hand provide a criticism of religious authority based on external knowledge lacking personal experience, while on the other hand they celebrate the path of yoga and its methods of engagement with the subtle body and its centres of occult energy and miraculous powers. Gordan Djurdjevic holds a PhD from the Department of Asian Studies at the University of British Columbia. He is co-editor, with Henrik Bogdan, of the collection of critical essays Occultism in a Global Perspective; and the author of Masters of Magical Powers, and India and the Occult. Shukdev Singh taught Hindi language and literature at the Benares Hindu University in India. He collaborated on the translations of The Bijak of Kabir with Linda Hess and The Deeds of Prahlad with David Lorenzen.